I placed all the tiles in the pumpkin picture except the lower left one that looks like a cross. and i have two candles.. Hurray!! - the 3 little kitties return!!!!! For the amidakuji puzzle, start with number at top and go down and first horizontal branch off, follow it and repeat (even if it branches upwards). In the middle desk cabinet (with four pumpkins on top), click on the books to move them to left, which will reveal the blue coffin object to put on the pumpkin picture. michele, I put the candles under the pumpkin, highlight the matchbox, and it lights. Putting all four objects on the pumpkin picture gives you a globe, which you put on the pedestal on top of the heater. This gives you another candle. Once all pumpkins are lighted, each pumpkin gives you a letter for the right cabinet which gives you the stick. having trouble trying to get the cats help with the key - any tricks to that? my metal bar wont open trap door,is there a trick to it ? Thanks michele, zooming out worked! Just finished - and the very happy post-end with those sweet, patient (!!!) kitties! 1dot12, its a hanging mobile, not a mobile phone. It is hanging from the ceiling with decorations on it. The key is hanging from it too. Just started. I have the cat and the hat blocks, and 2 candles. One from under the chair cushion and the other from putting out the flame on the one on the wall. I'm stuck. Can't find a stick or the other 2 candles or something to put on top of the gas heater...or something to hit the crazed wall or something to move the loose brick. Anyone still there who can help?? Used the cats on the crazed wall, and also on the loose brick, Soozn. You need to use the cats to scratch off the brick from the wall and kick a hole in the wall where the 'crazing' is. Just click the cat on the bottom left. How do I put out the candle? 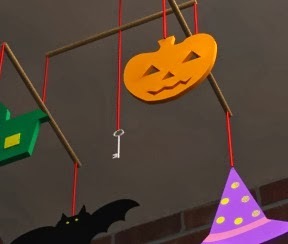 1dot12, there is a candle damper on the right hand side of the four pumpkin cabinet. Click on the floor on the lower right of it. @clio_rose ahh i see! thank you! Can't find numbers for supboard or bar for trap door. Any help? "Putting all four objects on the pumpkin picture gives you a globe, which you put on the pedestal on top of the heater. This gives you another candle. Once all pumpkins are lighted, each pumpkin gives you a letter for the right cabinet which gives you the stick." POP! I just hadn't clicked the book enough times to find the pink paper. Oh thank you clio rose and 1dot so much - I had forgotten that you can use the cats!!! Cats came in to help with the key on the ceiling. and they went away without the stick...what did I do wrong? Did you have the stick highlighted in your inventory, Jef? "Leave it to me," says the biggest one. But That's it. No, the stick is in the letter cupboard, its a metal bar. There is nothing to be got from above any window, as i recall. Have to leave now. Good luck. How to open color box? and where is key for box on table pls? catherine, are you sure it is the last key? Have you opened the brown box? whatever I do - i'm stuck on 90% loading -refreshed, gone to the site - ideas??? LNS: Idea 1. No idea. Idea 2. Don't worry. Idea 3. Have a drinkie? If all ideas fail, then just fib and pretend it was such an easy-peasy game, you got out in 30 seconds and what was all the fuss about. Just an idea, is all. good one Clio!! But can't drink - due on stage in an hour! These games are so uplifting - I love them - so cute and fun!! Always 5 stars!!! iconland2003, T__T tommy gave u answer at 9:39. You didn't even put enough effort in to look at the hints. Now that is sad. I needed help to find the candle damper. Loved it!! a Choko-Chai is always worth a replay - enjoy, mwahahahahah ☻! Wonderful game. There is no stick, it is a metal bar. Only pixel hunt is to the right of cabinet with four pumpkins on top.